I think one of the things I love most about creating recipes around produce is how easily adaptable that recipe becomes. So often I’ll create a recipe for one specific type of produce in one season and when the next season rolls around the recipe still works great with only a few small tweaks. This bread is nearly identical to my favorite pumpkin bread recipe from the late winter/early spring. All I did was create a similar puree of rhubarb to that of the pumpkin, added a few chunks of rhubarb, and took away a couple of spices I didn’t want paired with the rhubarb. It was really that simple. Come the end of summer, I look forward to making a similar bread with peaches or apples. So, if you ever see a recipe and think, “oh that would be good but I don’t have/like such and such,” take a step out of your comfort zone and try a substitution! Who knows, you might create something even more delicious than the original recipe! In a medium sauce pot, combine 1 cup rhubarb and 2 tablespoons of maple syrup. Cook over medium-low heat until rhubarb is broke down, 10-15 minutes. Set aside and let cook slightly. Preheat oven to 350˚and generously butter/oil a 8 or 9″ loaf pan. In a food processor, pulse oats until almost flour- I still like little pieces of oats left. 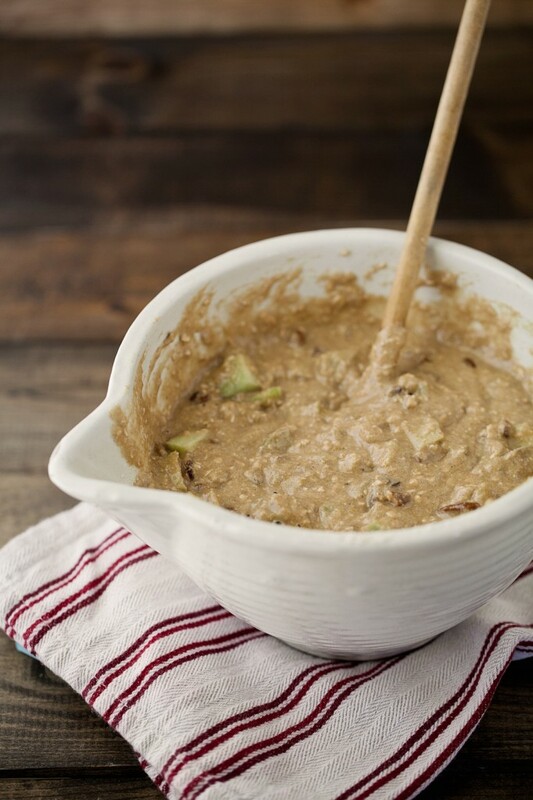 Pour into a large bowl and add wheat flour,spices, baking soda, and nuts. 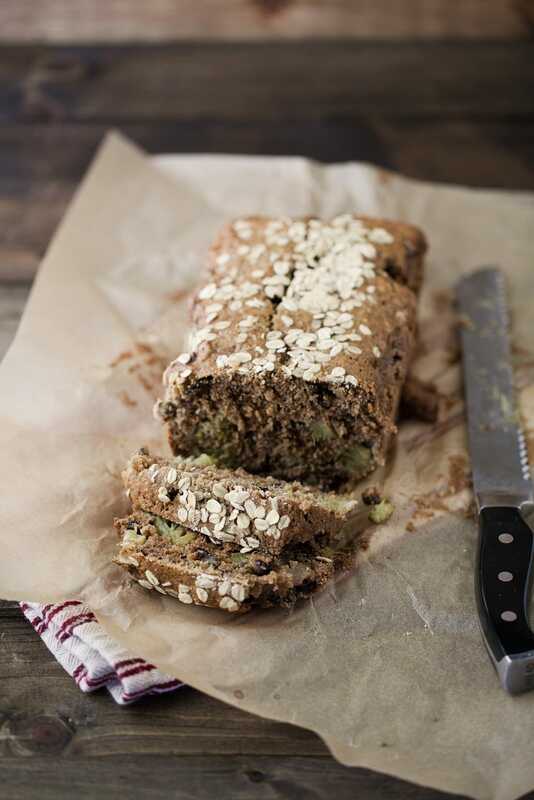 Pour into prepared pan and sprinkle with oats and nuts. Bake for 50-60 minutes. Top should spring back lightly and when a knife is entered, it should come out clean. Let cool and slice! This sounds absolutely delightful! Love this recipe! 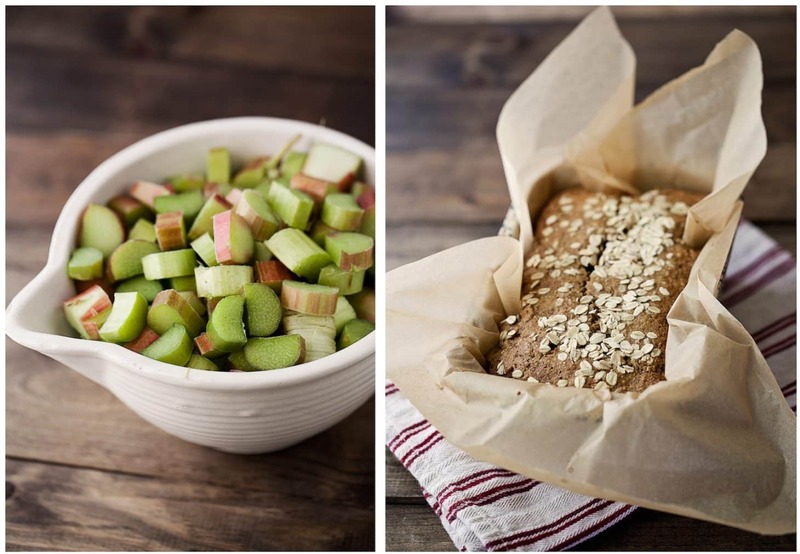 Oh I wouldn’t have thought you could make this kind of bread with rhubarb, what a wonderful idea! Yum! I love that you’ve used the rhubarb as a puree AND in chunks. 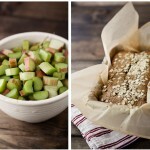 I’ve got some diced rhubarb in the freezer and a long car ride coming up, this would be perfect to make and pack along. What spices would go well in this bread? In the bread or pairing with the bread? Do you just divide rhubarb in half? Fixed- 1 cup for the puree, 1 1/2 cups to mix in! Thank you…. Making this today. My mom is diabetic but would love this so I want to make some. Any idea on a carb count for this? If I don’t have have pecan or walnut oil on hand, what can I substitute? Hey Stephie, Any non-flavored oil would work or even melted butter (or coconut oil) will work! I LOVE finding blogs that I can plan my entire weekend menu from! Yummy weekend ahead! I didn’t have enough rhubarb to do the recipe, so I added 2 apples; also, I changed the eggs for chia gel to make the recipe vegan. It is delicious! It took me around 1h10 to cook. Will definitely make again!! Thanks for the recipe! !